As you may know using an Overlocker is the fastest and neatest way to seam stretch fabrics but these are expensive and take up valuable space in your home. I have collected together some essential information to help make sewing stretch fabrics on a basic sewing machine a successful experience! Common in dress making fabrics for it’s comfort! Common in garments such as swimwear, active wear, and dance wear. How much the fabric stretches and if it goes completely back after it has been stretched. A style of stitch that will not snap when stretched. You must use either stretch or ball-point machine needles when sewing stretch fabrics. Because these needles part the fabric they don’t make holes where as universal needles can leave holes in some woven fabrics. They can also miss lots of stitches in very stretchy fabrics making it impossible to sew a seam. 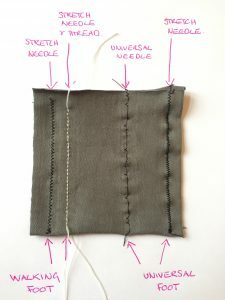 You can use either ball-point or stretch needles for most projects but only stretch needles work when sewing very stretchy 4-way stretch fabric. Another needle you may like is a stretch twin needle. This needle is commonly used to hem stretch garments. It sews two parallel lines on top with a zigzag underneath and will give your finished hems a lovely professional look. Stitch choice plays a big part when sewing stretch fabrics. Because regular polyester thread doesn’t stretch but the fabric does you could end up with the thread snapping and holes in your seams! 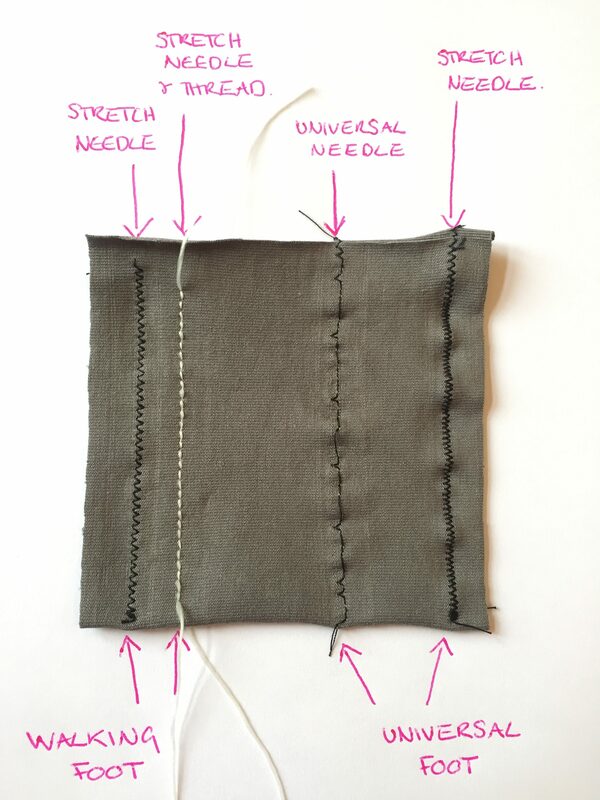 It is therefore necessary to use a stitch that stretches… unless you use a stretchy thread… more about that later!! There are a few stretch stitch options you can use and you will need to practice these stitches in order to find the one that work best for your project. Below are a few of the most common stitches. Please look at the instruction manual to identify these stitches on your sewing machine. Zigzag stitch is the most common. Adjust the stitch width and stitch length to get the right stitch. It needs to be as narrow as possible with a small stitch length to get the stretch. Triple Stitch is a ‘stretch stitch’ and will be located at the top of your stretch stitch selection. It is basically a back-stitch… 2 stiches forward and 1 back, which works well but must be used with caution, as it is bulky and can distort the fabric. Triple Zigzag Stitch may be necessary when sewing super stretchy 4-way stretch fabrics! Again you will find it at the top of your stretch stitch selection. This is also a backstitch but a zigzag version and so it can also be rather bulky. Over Edge Stretch Stitch is the domestic machine’s version of an overlocking stitch so if you want an overlocked look and small seam allowances this is the one to use. This is quite a time consuming process, as you have to cut away the excess seam allowance after sewing each seam. There is now this amazing stretchy thread from America, which is available on Amazon. It is pretty expensive so I have just bought the Eggshell and Black colour to start me off. This stretch thread is easy to use. You can wind a bobbin and thread your machine like normal. For sewing, set the stitch length to 3, and the tension to 4.5. You can then stitch a regular stitch… As the actual thread will stretch, the stitch doesn’t have to! Of course, you can still use a stretch stitch if you want to… all of the stretch stitches perform even better when you use stretch thread. Stretch fabrics tend not to fray so it is not always necessary to finish the seam allowance. If you want to make the seams extra secure or flat you can zigzag the seam allowance together as you normally would. With a 2-way stretch fabric you can usually stitch down the length as normal because the fabric doesn’t stretch down its length, only across its width. You can sometimes get away with just loosening the tension on slightly stretchy fabric, as this will give the stitch a little slack/stretch. I do this when top stitching a wider neckline or armhole that doesn’t need to stretch much as I prefer the look. When you are sewing something non stretch like interfacing, seam tape or trim onto a stretch fabric you can use a normal stitch. It helps, where possible, to sew with the no stretch on top. If you use a regular presser foot, which presses down on the fabric as it’s fed through the sewing machine, the fabric will stretch and the stitches will hold that stretch in place. The best way to stop this from happening is by using a Walking Foot. This foot bounces up and down while you sew, which is a bit off putting to start with but it works brilliantly with stretch fabrics. It’s also great for quilting, as well as sewing velvet and slippery fabrics that never seem to stay where they have been pinned! This is because the presser foot pushes these more challenging fabrics out of place! The Walking Foot is honestly one of the most useful feet I have ever bought. I absolutely love it! Also known as an Even Feed Foot, the Walking Foot is quite expensive but if you plan to sew a lot of stretch fabrics and don’t want to buy an Overlocker I would really urge you to splash out and buy a Walking Foot.